What goes up, must come down. Two wrongs don’t make a right. You can’t spend more than you earn forever. Some truths are self-evident. Some consequences are inevitable. Even if the status quo allows us to indulge in a seeming alternative reality where basic rules of mathematics seem to no longer apply. In the end, no person, household, company, or government can successfully survive if it requires a never-ending flow of borrowed money. Which seems downright unfair, given they are all encouraged to fully embrace hyper-indebtedness over the short, medium, and long-terms. Finance your lifestyle on credit cards, because you can barely keep up on your student loans, which is hard to do because of your mortgage payment. Take on as much corporate ZIRP debt as you possibly can, because all anyone cares about is your performance over the last 90 days anyway, and by the time that massive debt hoard becomes an issue, you'll be gone as CEO anyway. Replace 'corporate ZIRP debt' with 'runaway deficit spending' and 'CEO' with 'president' and that essentially sums up the federal government, too. Everyone likes the guy who pays the bar tab with an open credit card. How many friends stick around once the card stops working, once the bank cuts him off? For the 29th week in a row, Americans rate of spending has increased at a higher rate than their incomes. So long as credit is easy and plentiful, no big deal. What happens when the next crisis locks up the credit markets, as each of the past two crises have? What do you do when your income can’t cover your expenses, and there is no credit card to make up the difference? 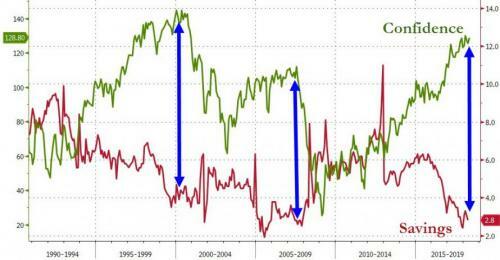 "As a reminder, the vast gap between extreme high confidence and extreme low savings rate - a borrow-my-way-to-happiness narrative - has never ended well in the past." Now extrapolate that out. What do you do as a nation when you’ve printed your currency into worthlessness, having along the way created an entire economy based on leveraged risk-asset inflation? The US is allowed only as much leash to continue in its profligate ways as global faith in the dollar provides. Everyone puts up with the nation who enriches exporters around the world with its culture of wild debt spending. The change in global attitude toward the US, once its own dollar-Ponzi-scheme implodes, will be as ugly as it is sudden. 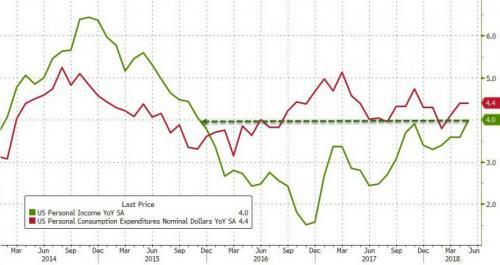 For the 29th month in a row, Americans annual spending grew faster than their incomes as the 'no consequences' new normal rolls on, leaving the savings rate languishing near record lows - even if it did very modestly uptick in May.